October is Archives Month, and as part of its recognition of the auspicious occasion, the Smithsonian’s institutional archives has posted a blog titled The Smithsonian’s Top 6 Archives Myths. So far as I know, here at the American Heritage Center we don’t have any archives myths (with the partial exception of the belief, by some, that founder Grace Raymond Hebard haunts our building), which, for Archives Month purposes, is too bad. However, we do have a set of “Most Frequently Asked Questions,” and perhaps those will do for the purpose. 1) How much “stuff” do you have? Roughly speaking, 75,400 cubic feet (a cubic foot is approximately the size of a carton of printer paper) of manuscripts and archives and 60,000 rare books. A cubic foot (actually 1.2 cubic feet, to be precise) storage box is 15 inches long; laid end to end our boxes would stretch 17.5 miles. We’re also often asked how many “items” we hold. A storage box holds about 2,500 pieces of paper. So 2,500 x 75,400 boxes = 188,500,000 pieces of paper. Plus the 60,000 rare books, for a grand total of 188 million, five hundred and sixty thousand items (give or take a few). AHC stacks; despite their appearance, we have plenty of room. 2) Are you full? No, not even very close. We have approximately 100,000 cubic feet of storage space in our current shelving configuration. Were we to be able to raise the funds necessary to install compact (aka “mobile”) shelving into all our storage rooms we would increase our capacity by 25%. With compact shelving instead of having an aisle between every two rows of shelves there is essentially only one aisle for an entire room full of shelves—it’s just that this aisle moves to permit access to any given row of shelves. Not having so many aisles means more capacity for boxes and books. Unfortunately, it is difficult to interest philanthropists in supporting something as mundane (and essentially invisible) as additional shelving, so we can’t anticipate the additional space any time in the near future. Fortunately, based on our average acquisition rate, our current empty shelf space will last a couple of decades or so. 3) Do you take everything offered to you? If we did, we would have filled up our shelves quite some time ago. Our archivists are skilled in making difficult decisions about both which collections we wish to acquire and which parts of a collection are perhaps not significant enough to warrant long-term preservation. 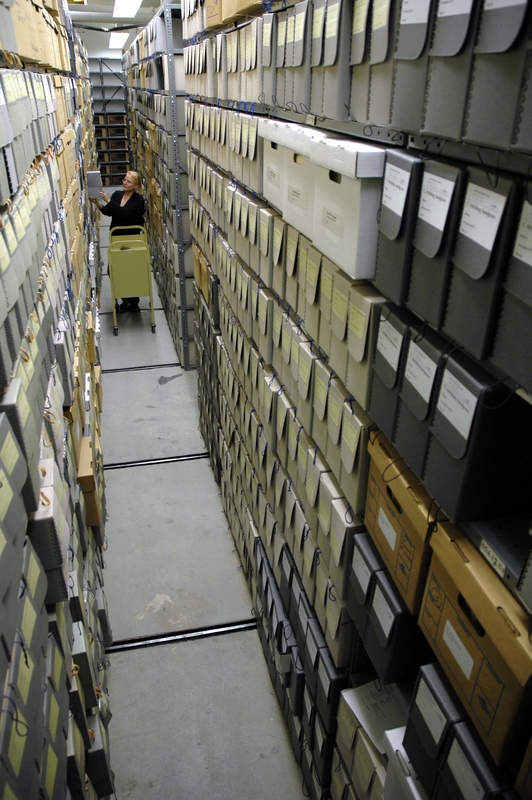 In government archives the longstanding rule of thumb is that only about 5% of the records created are retained by the archives. For us, the percentage of material offered to us that we accept is much higher, but an important reason is that we are often offered material that we have ourselves requested be preserved here. Our archivists spend time researching individuals and organizations whose contributions to our region or to one of the topical areas we collect is significant and substantial enough for us to solicit their papers. Even then, we typically don’t take everything offered to us; many records of modern life are simply not likely to be of great assistance to future historians, sociologists, and other researchers—a typical example would be utility bills or bank statements. 4) How do you decide what to take? While the process of making such decisions remains a matter of professional debate, at the AHC we primarily approach such decisions using a combination of “macro appraisal” (a concept that originated in Canadian archives) and good old-fashioned American pragmatism. Macro appraisal posits that the first decision should be which creators of records (whether individuals or organizations) a repository considers relevant and significant enough to wish to document. Best practice is to lay out relevance and significance in a formal collection development policy, though barely half of even the most elite U.S. repositories have one. Only after identifying the records creators, according to macro appraisal, does an archives select among the records produced by a given individual or organization. For that level of selection, AHC archivists are informed a good deal by the types of materials that have been, over time, most helpful to researchers. This is where our inclination to normally select diaries and emails but not acquire utility bills and all 150 phone-camera images of someone’s birthday party comes in. As you can readily see, archival decisions about what to keep are not based on an exact science. However, we believe that we ought to be able to explain how and why we came to a given decision, rather than using something as inexplicable as intuition. 5) When will everything be digitized? The short answer is “never.” The easiest explanation is that we have 188 million-plus items in our collections, and even at what, for the archival profession, has been our rapid pace of 75,000 scans in the past two years it would take 5,000 YEARS to digitize our existing holdings—and that doesn’t include all the material we would acquire in the meantime. It also doesn’t account for the fact that copyright laws prohibit us from placing large portions of our holdings online. Nevertheless, we will continue to work toward being at the front of the pack in terms of how quickly we do scan our collections. 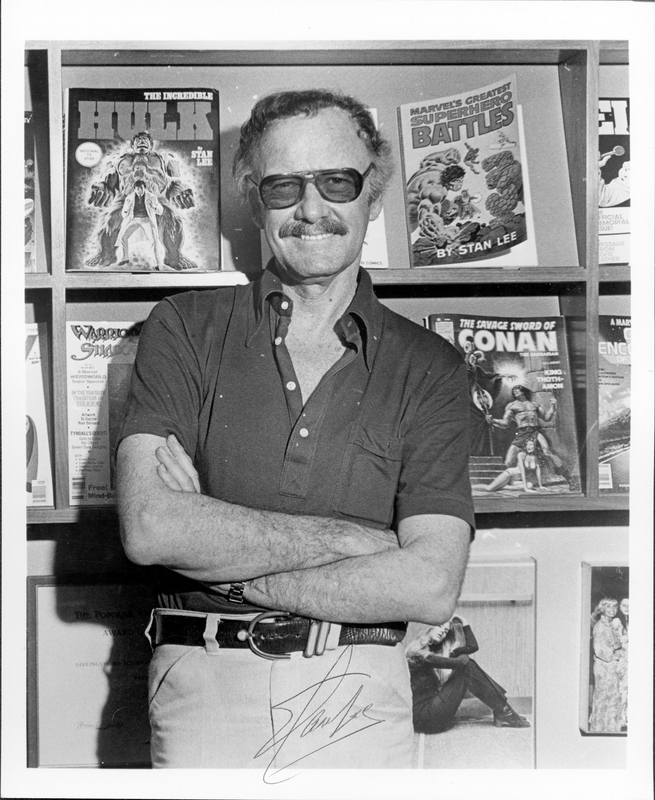 The papers of Stan Lee, above, are exemplary of our popular culture collections. 6) Why doesn’t the AHC collect only Wyoming history? The Center does hold one of the most significant and substantial collections of Wyoming and Western history, particularly for the 20th century, in the nation. But we also hold internationally recognized manuscript collections for: U.S. aviation and aerospace, U.S. environmentalism, world economic geology, U.S. popular entertainment, U.S. journalism, U.S. military history, U.S. ranching, post-war U.S. conservatism, and “Asia through American eyes”; our rare book library documents (among many other things) the world’s religions, the global evolution of printing, and world-wide travel and exploration. Why do we have so much material that is not restricted to Wyoming or the Western U.S.? The answer is that traditionally America’s land grant universities have believed their repositories—as well as the university itself—should give students and citizens the chance to learn broadly (thus virtually every land grant university has primary source collections that extend far beyond the state’s borders). The students and citizens of Wyoming, no less than those in any other state, deserve to have access to historical sources of relevance to some of the school’s broad areas of study. Moreover, events in Wyoming have to be understood in the context of national events, and events in Wyoming have repercussions in the rest of the nation. This entry was posted in popular culture, resources. Bookmark the permalink.